Continuing with yesterday’s theme, here is another. 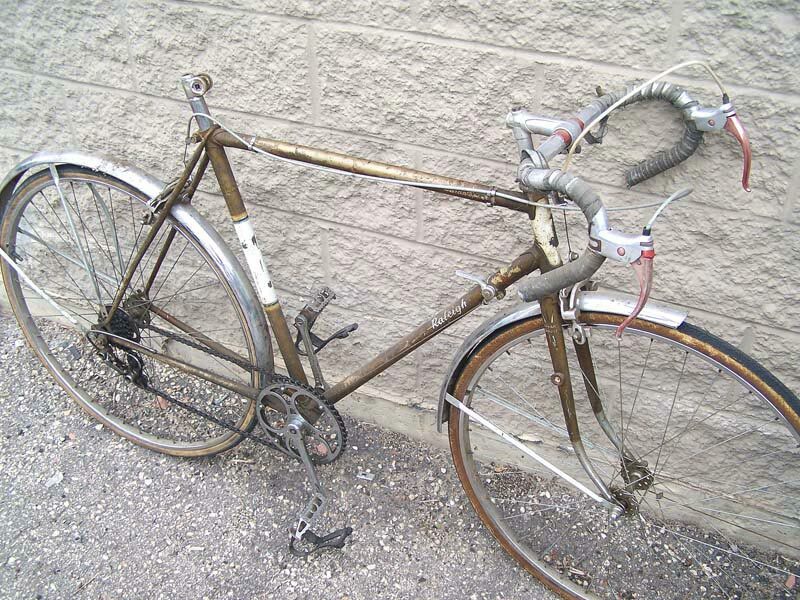 This is Bob H.’s Raleigh Super Course. Just a couple weeks ago we received our first Super Course from Alex K and days later, I received this—the apparent elder of the two. 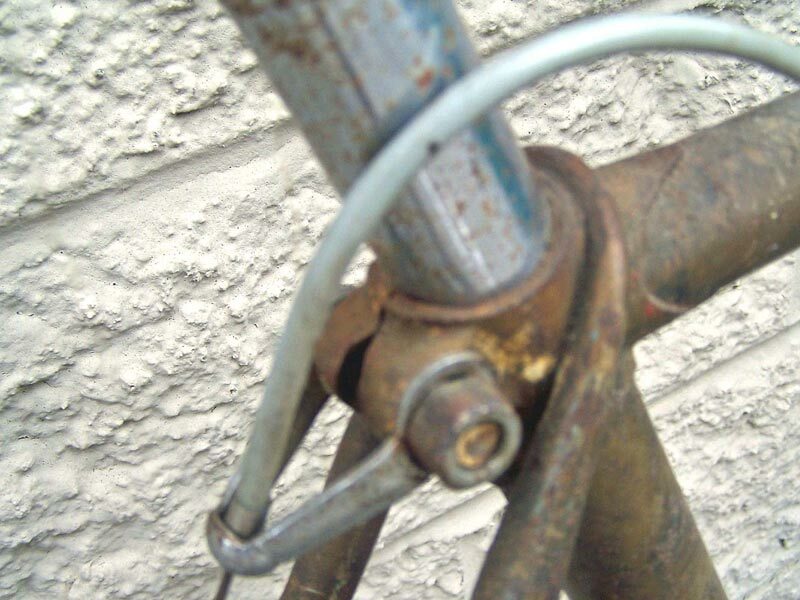 Old Raleigh has ten speeds but no front derailleur, Campy rear derailleur. I’m not sure but I think chainring shifts are done manually. Must have been quite nice when new, in the 1950s, maybe? It was discarded at a local bike shop, a joint venture between Trek and the Boys and Girls Club. They take donated bikes to repair & resell but this was deemed not worth the effort. I’m not sure what I’ll do with it. I recently submitted almost the exact same bike ….mine is a Gran Sport though. Its written on the fork. 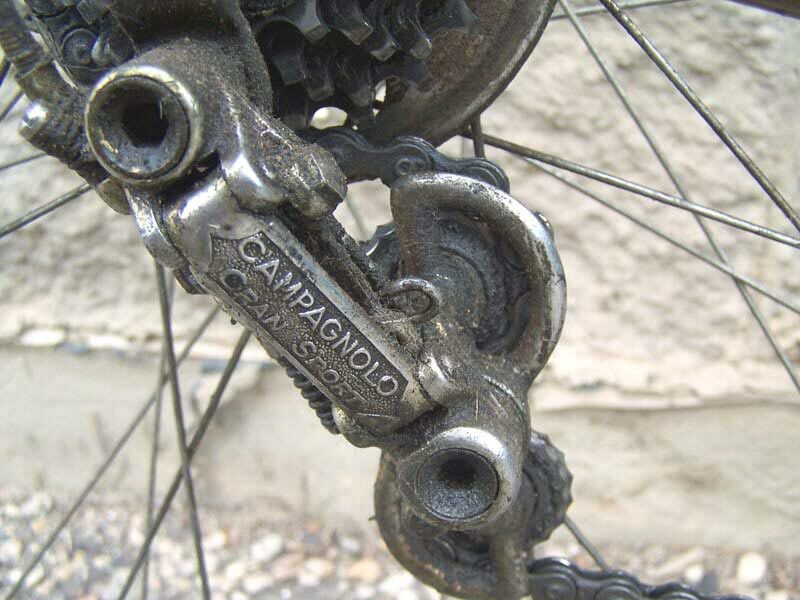 Campagnolo invented the rear derraileur, and this ‘gran sport’ model was the first one they mass produced. There are a few prototypes around that look the same, only with a couple more tuning screws. Not sure when mine will be up on OTSG, but you’ll see mines exactly the same just about. I’m pretty sure these were made in 1966. At least mine anyway, because the brakes on mine have ‘coureur 66’ written on them and I looked it up and it does indeed correspond to the year they were made. Can’t see your brakes in these pics so maybe yours is different. I don’t know much about ten speeds, except a little about this one from having looked into it after finding mine. I was offered 900 dollars for mine, which is in worse shape than yours. Conclusion: good score! My bad. This bike is also a Gran Sport, not a Super Course! I was relying on memory when I sent the pics but found I was wrong when I actually looked at the bike in the garage. $900 sounds like a good donation to my home remodeling fund . . .
That bike is strange. 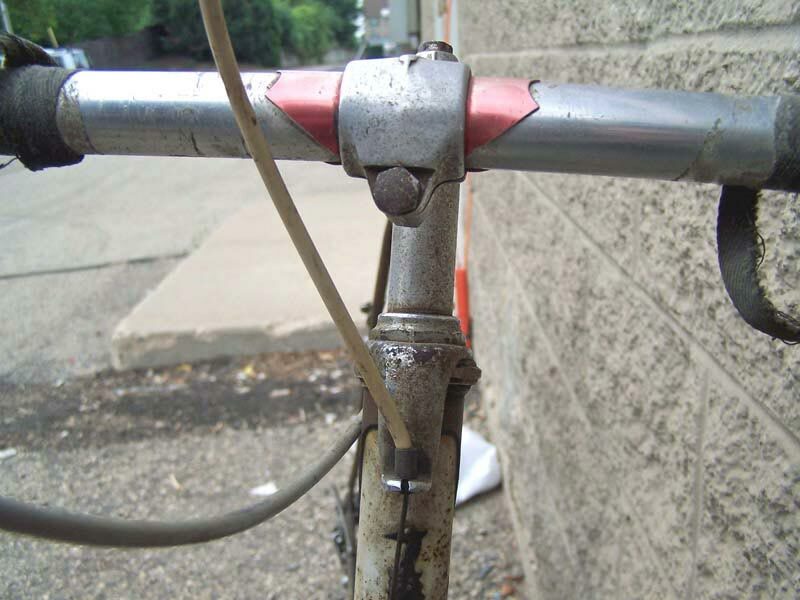 The frame looks like a hightensile gran sport from the early 60’s, but then the headtube heron dates it a few years later, while the cranks pull it back again. I would say that it is a 64ish. If you ever want to part with it, my wife needs a raleigh. Is the rear wheel a flip-flop? Hi, all, this is a great blog. I’m simultaneously working on an old Raleigh Record (not sure what year, but bright yellow) and a crappy Huffy Dash (rescued from a trash pile). I seem to have misplaced the crank bearings while rebuilding the Dash and wonder if anyone would know if an old Dash takes a #64 or a #66 size. Apparently the # of bearings is the main difference. Good luck fixing this one up! The front der. would have been a campag also. 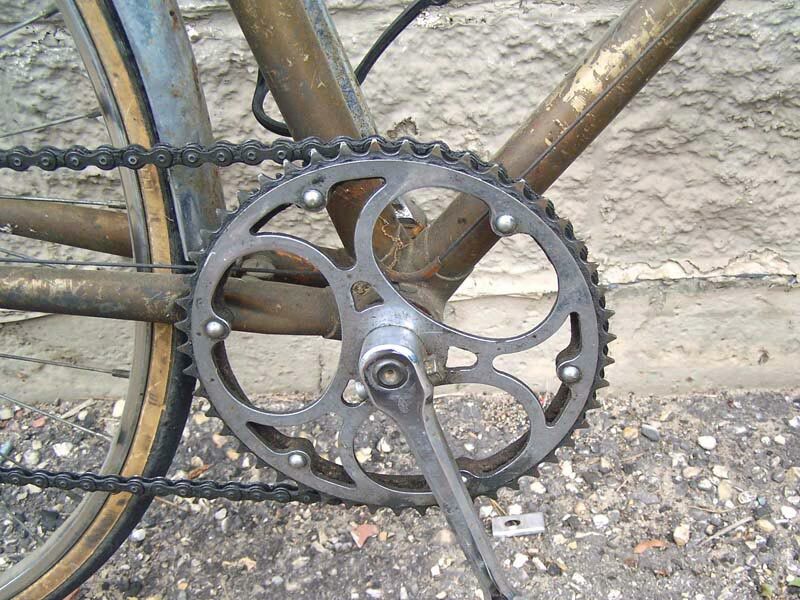 I can tell by looking at the picture of the cranks that there used to be a der. there. I have just finished restoring my ’61 Raleigh Gran Sport. Owned by my father, handed down to both my older brother and then eventually me (in 1976). I used for about 10 years and then forgot about it until March this year (2009). I found it in a broken down state and have since then gradually restored what was available and replaced what wasn’t. Just rode it today – it rides beautifully, not better or worse than my current Aluminium and carbon Trek, just different. Any heres to another 48 years (for the bike) hopefully more for me! It is always sad to see a fine bike neglected. I usually grab the steel wool and a can of wax and glove up and start polishing while all the while muttering about the fool who let it get so bad. Hours later the bike looks far better. a lttle pitting of the chrome is tolerable and most of the crusty rust is removable, grease oil and tires and tubes a resurrected saddle from the parts bucket and head on down the road. Go for it/ good therapy. Old post I’m sure but needs to be said. The bike serial # needs to be looked at to determine the yr. The 66 in the brake does not indicate the year. Those brakes came out in 1961. Nice bike, I have one early 61 same copper bronze color What have you done with yours in the interim, do you still have it? What to do? Put a seat on it, pump up the tyres, and go for a ride. Others below have interesting comments about restoration etc.